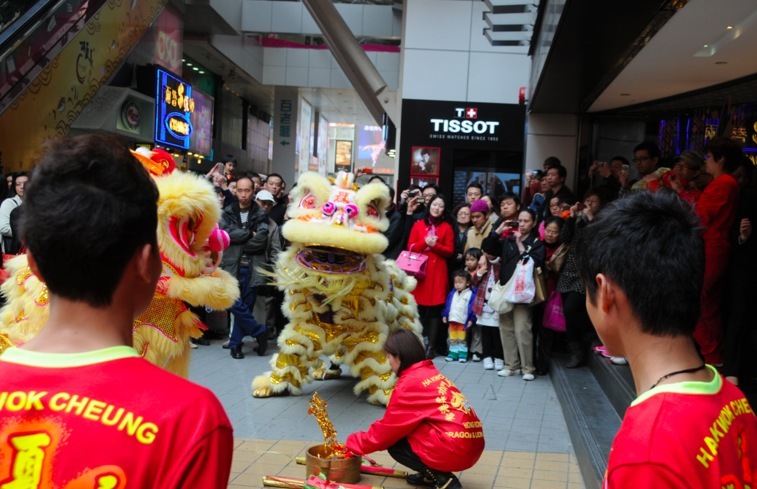 Lion dances are really popular in Hong Kong – not only to Chinese New Year, but actually every big business/company will have a lion dance at its opening or anniversary. 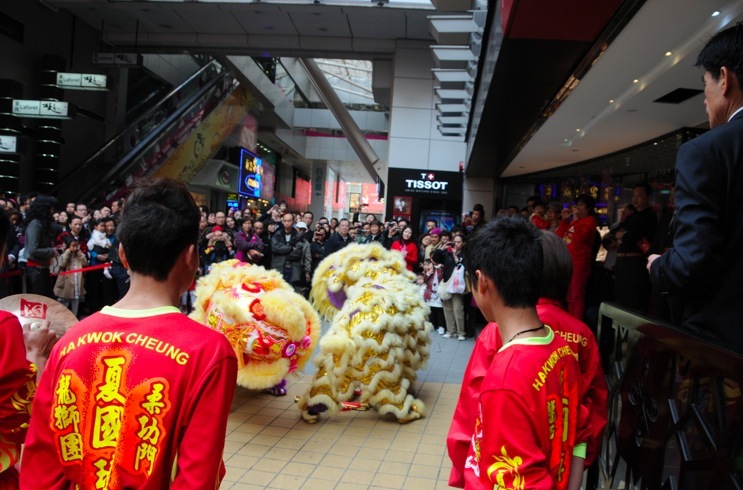 Lion dances signify good luck. 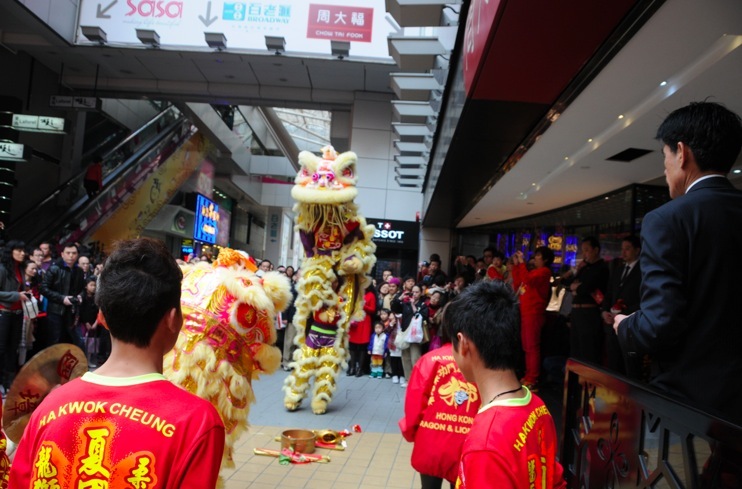 Of course, with Chinese New Year being a popular time for people to go shopping in Hong Kong we’ve managed to see a couple of lion dances in shopping malls and in front of restaurants. 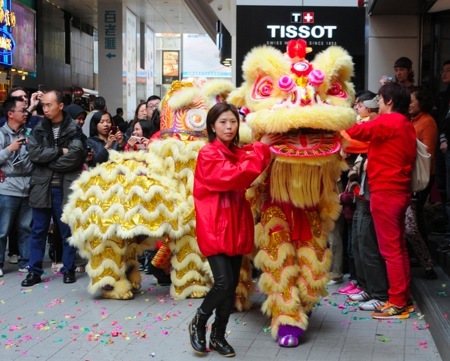 On the first day of the Chinese New Year many shops are traditionally closed, but starting from the second day, some big stores and chains reopen and you can see a lot of people travelling to the city centre or to shopping malls to spend the money from their red packets. 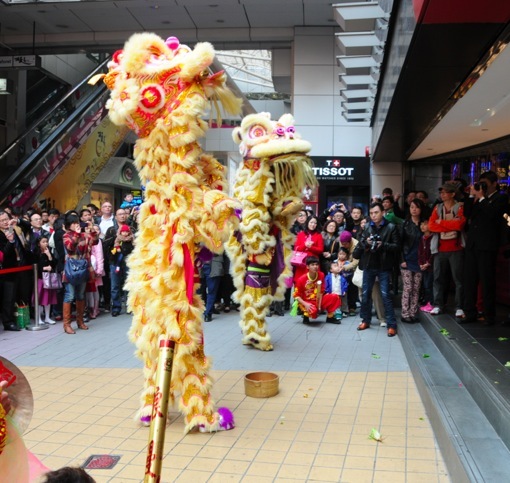 We were not planning to go shopping, but we were looking for a late lunch in the Causeway Bay area, when we noticed a lion dance starting in front of a big and famous jewelery chain. 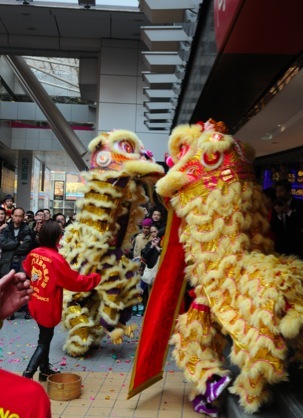 The lions are not real (of course) – there are two men in each costume. One at the front, holding the head and the other at the back, bending down and pretending to be the hind legs of the lion. The front men has to lift the head, move the mouth, eye lids and ears of the lion (there are strings inside the lion head), while the bottom men always has to walk bended downwards and sometimes has to lift the front men on his shoulders or high up in the air. 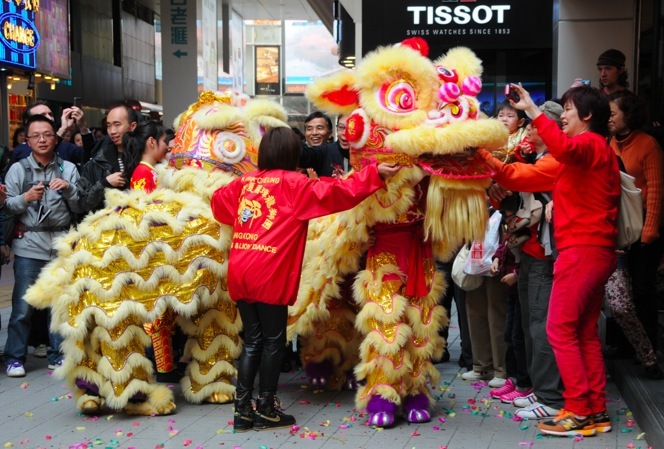 Either way, it’s hard work and the lion dance always lasts a couple of minutes only – afterwards, people try and touch the lion costumes for good luck, before the lion and the men leave the scene (to remove the costumer and have a well-deserved break!). It’s a fascinating show, which always draws my attention to it! 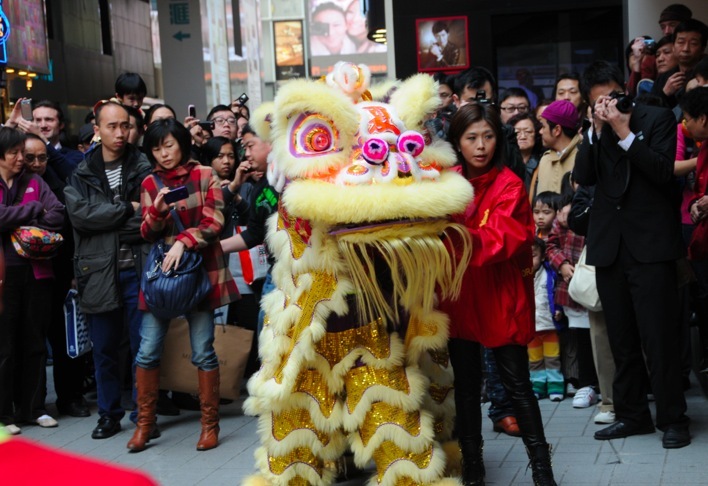 Here is some info I found on Wikipedia about lion dances at CNY: During the Chinese New Year, lion dancer troupes from the Chinese martial art schools or Chinese guild and associations will visit the houses and shops of the Chinese community to perform the traditional custom of cai ching. This means plucking the greens, a quest by the lion to pluck the auspicious green (normally ‘vegetables’ like lettuce which sounds like the word for fortune in Chinese) and auspicious fruit like oranges tied to a red packet containing money; either hang highly or just put on a table in front of the premises. 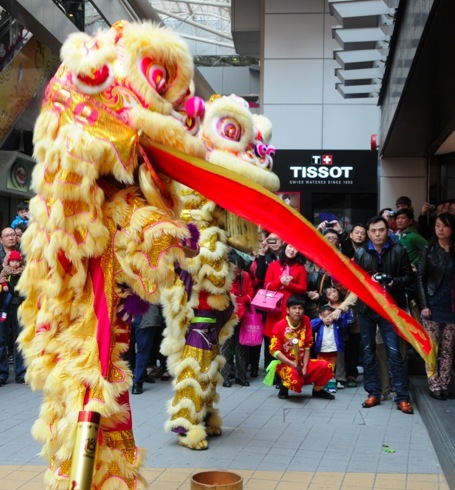 The lion will dance and approach the green and red envelope like a curious cat, to eat the green and spit it out leave it in a nice arrangement, like a auspicious character, but keep the red envelope. That’s exactly what they did in front of the jewelery shop.